July 17, 2018 | By Fatima V.
Every July CDW locations across the US plan Fun Drive to raise awareness regarding their CMN hospital partnerships and community partners. Events take place throughout the month with engagement and fundraising opportunities for employees. This year CDW in Addison had the pleasure of hosting Logan Parker, who has been treated at several CMN hospitals in Texas. 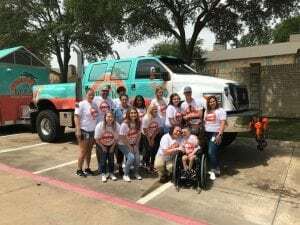 CDW made the day “Logan’s Day” and brought food trucks, Bahama Bucks, video games and puppies followed by Logan and his family attending a Frisco Roughriders game. Children’s Health and CMNH representatives were preset throughout the day to participate in activities and supper Logan and his family.